I am delighted that in my first week as Head of the Civil Service we are publishing the Civil Service Talent Action Plan which confirms our aspiration to be one of the most meritocratic, open and fair organisations in the country, fully reflective of the society we serve. 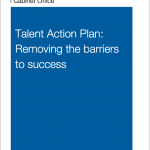 Read more about my thoughts on the Talent Action Plan on the Civil Service blog. There are days when you feel like the machine is just sending out propaganda! 1. Tells 25% of its staff at the beginning of the year, no matter how good you are and what you do you will be in a category 3 at the end of the year. Where a good employer would be striving to have all its employees in a category 1 at the end of the year! 2. If you have a disability your twice as likely to be in a category 3 than if not, and ½ as likely to be in category 1 if your disabled. Some how it doesn’t quite make so good reading now! Seriously, do I really give a damn about yet another high flying iniative. My work load has increased two fold, my pay rises are derisory, the bonuses have been removed for all unless they produce shiny presentations for 2* officers and my morale is at an all time low. I am just killing time until I can take my pension early and get out of this god forsaken organisation which waffles on about talent management whilst crushing the morale of 90% of it's staff. My thoughts exactly. Wonder how many fast track candidates come from working class backgrounds. Now there's a sensitive talent retention issue. When I joined the Civil Service in 1995 working for the Health & Safety Executive, Sir Jeremy's opinion of the Civil Service today was accurate. There were what I would call a model employer. However on Joining Jobcentre Plus in November 2009 I realised that it was not true of Jobcentre Plus. Before the whole of the Civil Service can improve parts of it , such as Jobcentreplus need to be bought up to the same high standard as other parts of the Civil Service such as The Health & Safety Executive. There is no excuse for such poor quality and unproffessional management especially when sections of the same department are getting it right !